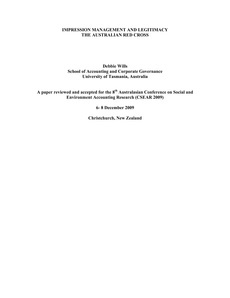 The purpose of this study is to identify whether a charitable organisation such as the Australian Red Cross, use their annual reports for legitimating purposes. The aim of the paper is to assess the quantity and type of annual report disclosures used by the Australian Red Cross. This analysis is performed in order to determine if there is a change in the use of impression management tools when their perceived legitimacy was threatened as a result of criticism over their use of donated funds after the Bali bombings in 2002.